Early in a freeze out tournament one thing goes through my mind when I am dealt AK, as follows, a pair of 2’s can beat my hand! You have to remember that big slick is still a drawing hand. Its not even a small pocket pair like deuces. It is not a favourite against a even the smallest pair of twos and you will have to improve to win the hand. I think in the early stages of a tournament you must be very cautious with AK. Its not worth losing all your chips just because you have big slick! I don’t know how many times I have made notes on people in tournaments that say, “will go all the way with AK”. 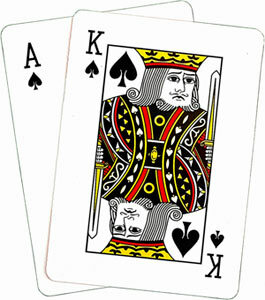 There could be three hearts on board, a possible straight and they will call anything because they have AK. Its amazing, but it happens! Scotty Nguyen once said in an interview, “I get knocked out with kings and aces; A-K doesn’t mean anything. I’m not going to let A-K break me.” To me, this says it all. So early on in a tournament, I definitely play A-K, I class it as a premium hand, but I am very cautious when there is a raise after me or I don’t hit the flop and there is a bet, even just a minimum bet! The last thing you want to do is get into a raising war early on with someone who might have a mid pocket pair. The risk is just way to high. Always keep in mind, you’re the one who has to improve to win against any pair. A-K is tricky to play because you will probably raise with it before the flop but then if you get called and miss the flop, what do you do? Do you throw out a continuation bet? That could be as many as 6 big bets to find out that your opponent may have you beat with a pair of 4’s. For me, during the early or early middle stages of a tournament I do not hesitate to throw A-K away as soon as I get any indication that an opponent is strong or I have not hit the flop and someone bets. Its just not worth it at that point. If you are approaching the middle to late stage of a tournament and you are a short stack or close to it (less than 10 big bets) big slick is a great hand to have. In these sorts of situations you can proceed with an all in bet to add as much fold equity as possible and even if you are called you still have about a 60% chance of making a pair. Another plus is that by that point in the tournament you are not likely to get called with just premium hands because the other players see you as the short stack and think you may be pushing with a less than a premium hand. You are more likely to get called from someone with any ace or unsuited paint, say K-Q or Q-J. Also if there is no big chip leader most may not want to risk a chunk of their chips to make the call. In either case you have a better than average chance to win and increase your stack. Now if you are in the middle to late stages of a tournament and are the big stack, A-K is also great to have. Think about it, if you make a raise and are called or re-raised all in by a player having a short stack it is less likely that they are pushing all in with AA or KK. It is more likely they have an ace or suited paint connectors or a small to medium pocket pair. You are a favourite in two of those three scenario’s I just mentioned and in the other one you are a slim underdog. If you pair you bust him out of the tournament. If he wins you are not mortally wounded. In other words big slick and big stacks love coin flip situations. Don’t Slip Up on the Big Slick Oil puddle. In closing, I always cringe when I have to throw away A-K. Its not easy to do. Something that helps for me is to always consider the down side. Early on I do not hesitate to discard big slick and am very cautious during the middle stage of a tournament as well. By the same token, I don’t hesitate to use big slick as a big stick if I am the short stack or have the chip lead. As with many hands in poker there are the positives and negatives to consider. As I said “a pair of 2’s can beat A-K.